"Dominant Team Playing at Home"
Looking for a proven betting system? If so, let's take a look at the results of the "Dominant Team Playing at Home" system. 2011 record for 2-game chase was 22 – 4 (84.6%); All games 22 – 15 (59.5%). Number of 2011 units: +10.45 (unit value = bankroll ÷ 50). Average odds: -136. See System #3 Final 2011 Results. 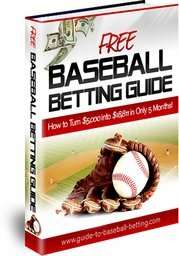 Some novice bettors think that a smart baseball betting strategy is to take the money line on the home team. However, this just is not the case. In 2011, only 10 out of 30 teams ended the year making money against the money line at home (NYY, BAL, DET, CLE, TEX, LAA, PHI, WAS, MIL and ARZ). And overall, home teams lost $13,091 at home. Does that mean that you never should put money on a home favorite? No, not at all. In fact, with a couple filters to weed out low value teams, it can be a very effective strategy. The basic premise of this next system is that dominant teams rarely get swept at home. Thus, we want to win 1 of 2 games at home AFTER the home team loses the first game of a 3 or 4-game series. If the series is 4 games long, and you lose game #2 and #3, skip the final game of the series. We find that the home team usually wins the 2nd or 3rd game and we don’t want to take on the risk of making it a 3-game chase. Objective of the system is to wait for the eligible team to lose game #1 before placing a bet on game #2. If the home team loses game #2, you place a second and final bet on the third game of a three or four-game series. We always bet using the money line for this system. You can instantly download step-by-step instructions on how to use this System and four other powerful systems by signing up in the right-hand margin. If you appreciated this Proven Betting System click here to get other sports gambling systems.